New Poll – How often do you visit the App Store on your iPhone or iPod Touch? Time for a new poll. The last poll was – Do you let your kids play with your iPhone or iPod Touch? Below are the results based on when we added the poll about a week and a few weeks ago. 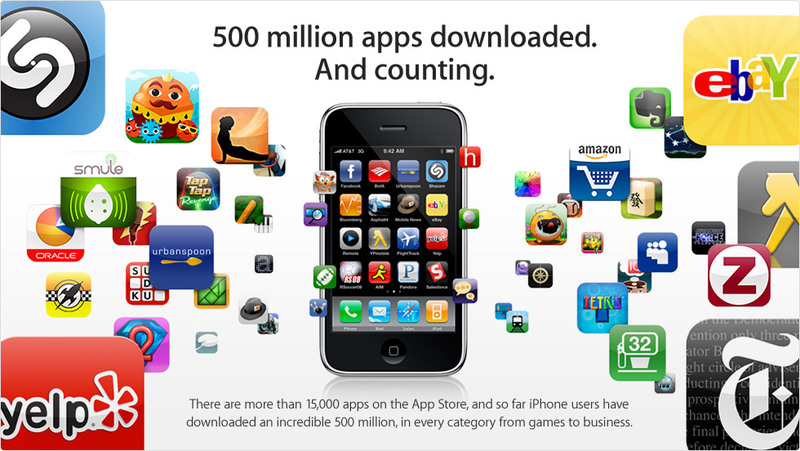 Apple’s home page shows they have reached over 15,000 apps in the App Store and over 500 Million downloads. This shows that the App Store is growing at an incredible speed. 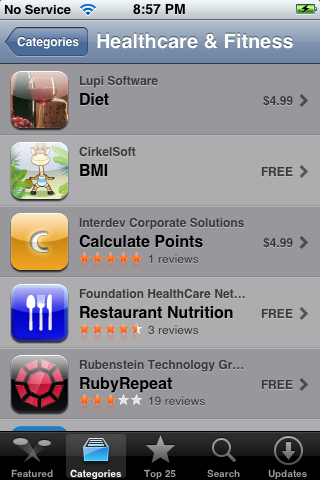 In early December the app store had over 10,000 apps according to AppShopper.com. It seems that Apple has finally done something about the application review issue in the App Store. The change now requires you to have purchased/downloaded an application in order to write a review of it. I’m not sure why this was not implemented from the beginning but, I’m glad that they finally got around to it. If you have not purchased an application, you will get a pop-up informing you that you will either need to purchase or download the app in order to review it. 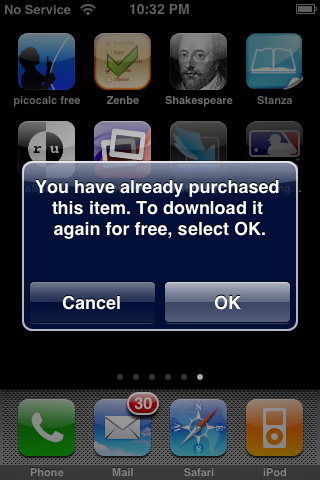 If the application is free, you have to have at least downloaded the application in order to review it. It has been a few days since I have been able to catch up on iPhone news, as those of you who follow Doug or my Twitter know (ahhyeah and bporter), I’m not feeling well lately! Well today, I was taking a look at the list of 25 top free apps and was suprised to see one that I was very familiar with…Earth3D. Well, I installer Earth3D however, when I went to open it, it just crashed back to the SpringBoard. So, I decided to go try another application…which crashed as well. 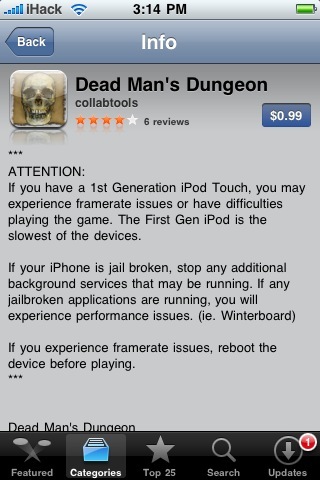 This is on my personal iPhone (not one of our test iPhones) so, it only has the AppStore and is not jailbroken. I did notice that I was having some issues last night while recording our video podcast but didn’t think anything of it. Well, it seems that ALL my AppStore apps are crashing, not a single app will stay open. So, after trying a few fixes, wishing my iPhone was jailbroken so I had SSH access and finally giving up…I ended up restoring. And like Doug, will be jailbreaking my 2.0.1 firmware using WinPwn 2.0.0.4. I’m curious to know if anyone else has had this problem and if you were able to fix it or ended up restoring. Doug and I knew that writing this post was inevitable. Did I think I would be writing it so soon…no. But, what can I say, hackers are quick. Cracked App Store Applications are in no way, shape or form, not even to the tiniest degree, supported by AppleiPhoneSchool.com. Any comments on how or where to get cracked App Store applications will be deleted. If the comments persist the user will be banned from AppleiPhoneSchool.com. Cracked App Store Application = Any App Store application that has not been put into the Installer by the developer themselves. App Store Developers Playing Dirty? If you have been in the App Store lately you may have noticed that developers have started adding spaces, quotes and numbers before the titles of their applications. In doing so, it moves their applications to the top of the list. Not only does this show extreme unprofessionalism by the developer, it makes the App Store look very disorganized. But it doesn’t stop there. It has been rumored that developers are hiring people to write positive reviews on their applications and negative reviews on competitor’s applications. There is probably not much that can be done about fraudulent reviews but, Apple needs to take a stand and regulate the titles of Applications in fear that the App Store will not only turn into a mockery but will affect the overall image of Apple itself. Ok, I knew that headline would get your attention. 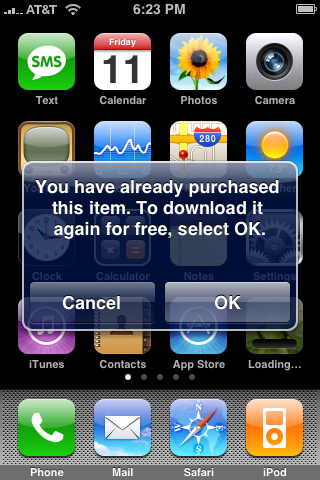 I certainly do not support hacking pay for apps to be free. But here’s the deal. All the Apps I buy on my iPhone, are downloading free on Brooke’s iPhone. We use the same iTunes account as a family so I’m sure this it why. I haven’t got a bill yet to confirm but I did get this pop up: I have confirmed that this works with many devices. We currently have the same iTunes account on 10 of our idevices.